The Irresistible Change Guide has been updated and changed names in the process. 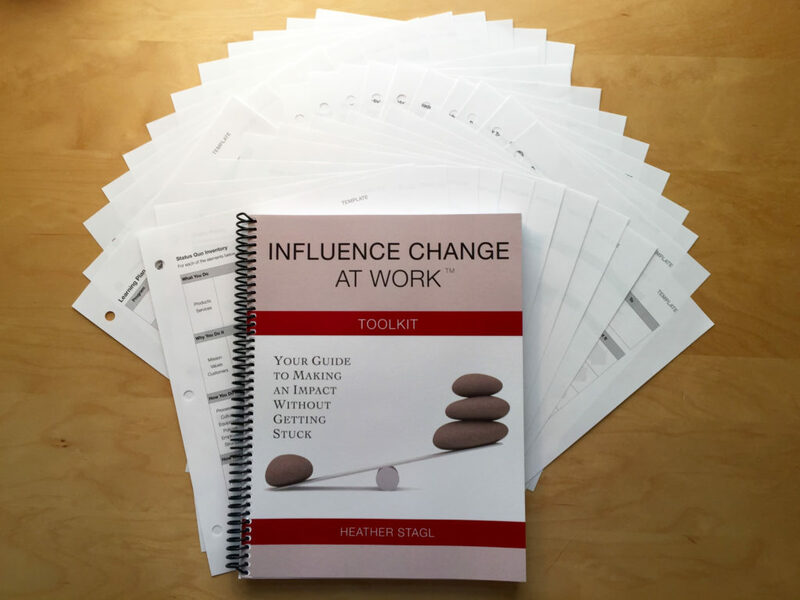 It is now the Influence Change at Work™ Toolkit. Does the prospect of making a difference make you excited, but overwhelmed by everything you have to do, and wondering what to do next? Implementing change is not easy, but it can be done without banging your head against the wall. For many years, I influenced change at work through trial and error. Once I learned what works (and a lot of what doesn’t), I started applying that learning to help others achieve results for their organizations. Now, you can use the same approach in a guide that breaks down change into manageable steps you can take to make a real impact without making the same mistakes: the Influence Change at Work™ Toolkit. Change agents at all levels have used the exercises and templates in this toolkit to implement new technology solutions, develop culture, execute strategy, improve processes, and implement a variety of other projects — with less confusion and frustration. Don’t add your name to the long list of change agents whose projects have fizzled out without this straightforward approach. Order your toolkit today, and equip yourself with the tools to help your organization break free from the status quo.